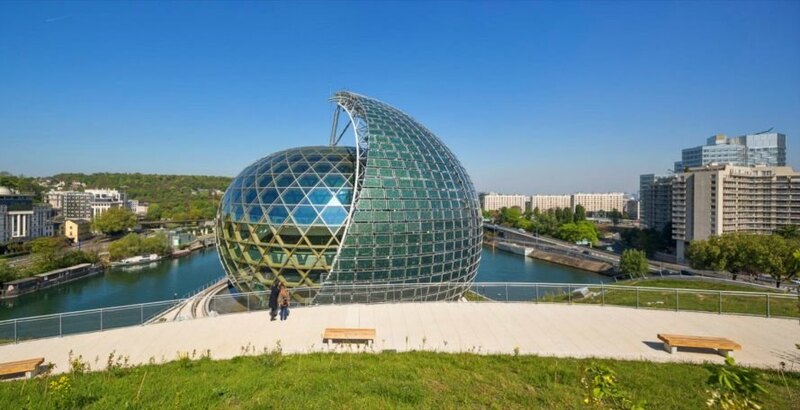 Architects Shigeru Ban and Jean de Gastines teamed up to create the stunning, solar-powered Seine Musicale located on Seguin Island in Paris. The shimmering glass globe is framed within by Ban’s beloved timber, and its exterior is wrapped with a massive solar panel “sail” that rotates around the building to follow the sun. Located in Paris’ Boulogne-Billancourt suburb, the urban project is part of Jean Nouvel’s Island Master Plan for Seguin Island. The multi-use building comprises a concert seating hall with a capacity of 4,000, a classical music hall that seats 1,150, along with various rehearsal and recording rooms. Additionally, the building is surrounded by ample green space for visitors and practicing musicians. Although the exterior is clad in glass panels, that doesn’t mean that timber-loving Ban has forsaken his green building material of choice. The hexagonal globe frame, including the building’s beehive ceiling, is made out of timber. However, the star feature of the design is undoubtedly the massive triangular sail covered in solar panels. 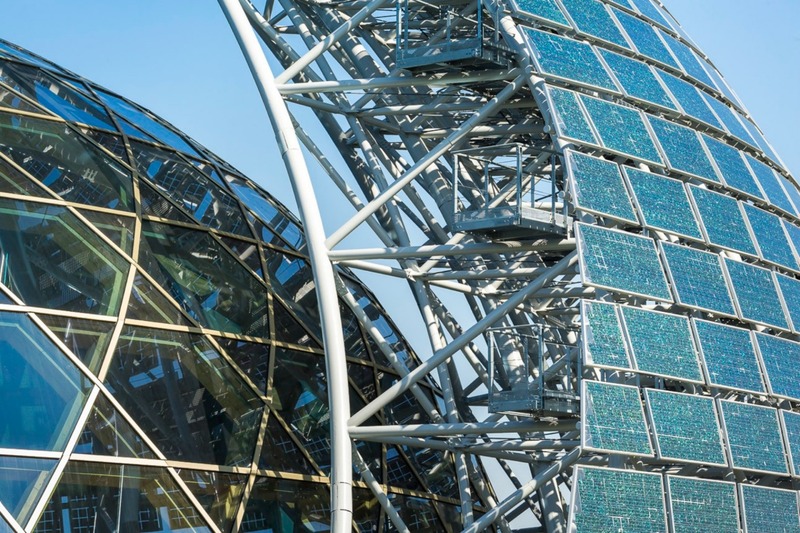 The sail will constantly rotate, following the path of the sun in order to provide the building with optimal solar energy throughout the day. The large covering also acts as a solar shield for the building’s all-glass Grand Foyer. 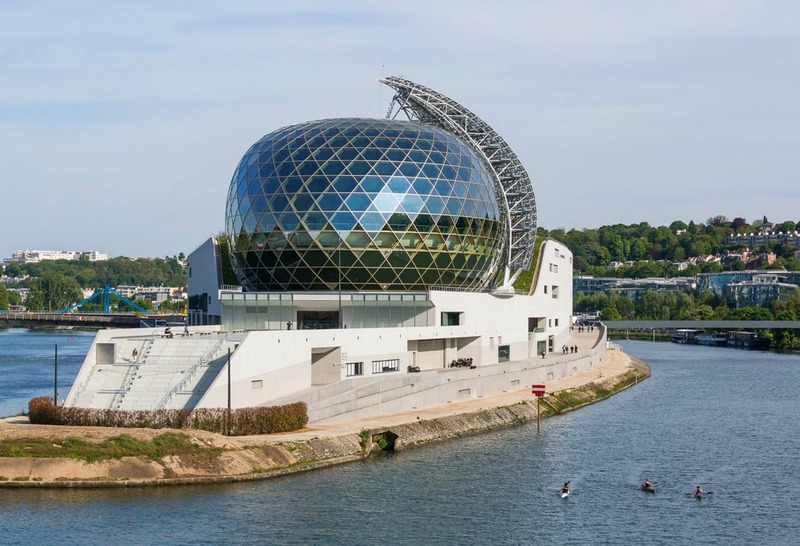 Architects Shigeru Ban and Jean de Gastines have teamed up to create the stunning, solar-powered Seine Musicale located on the Seine River's Seguin Island. 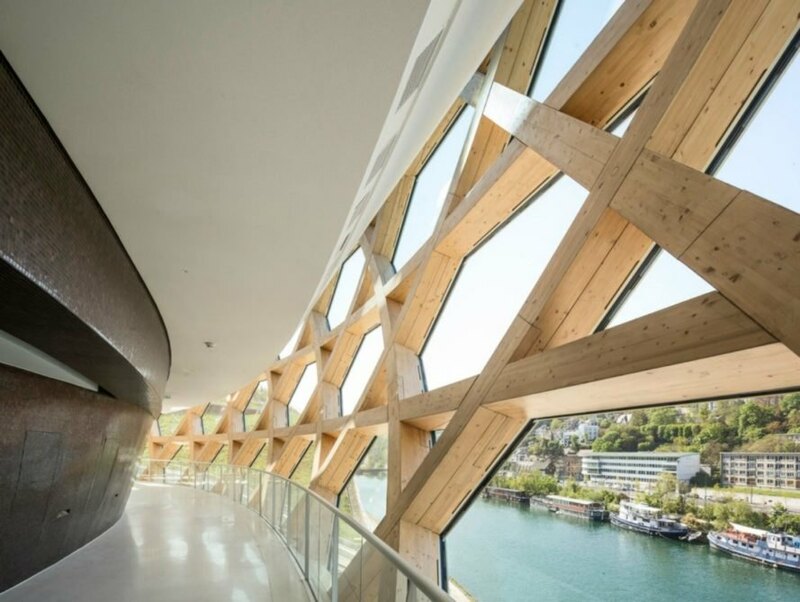 The eye-catching structure is a shimmering hexagonal glass globe framed on the inside with Ban's beloved timber, and partially wrapped on the outside with a massive triangular "sail" made of solar panels. 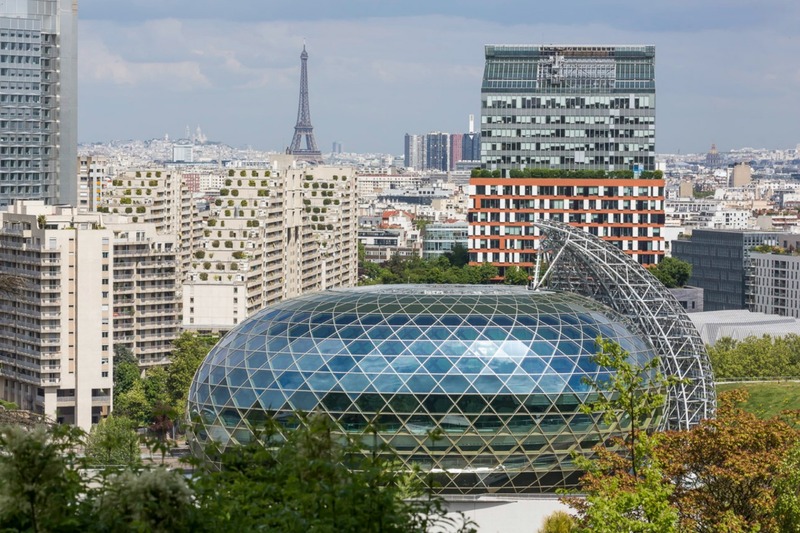 Located in Paris’ Boulogne-Billancourt suburb, the urban project is part of Jean Nouvel's Island Master Plan for Seguin Island. The triangular sail is clad in sola panels and rotates with the pattern of the sun. The multi-use building comprises a concert seating hall with a capacity of 4,000, a classical music hall that seats 1,150, along with various rehearsal and recording rooms. Additionally, the building is surrounded by ample green space for visitors and practicing musicians. Although the exterior is clad in glass panels, that doesn't mean that timber-loving Ban has forsaken his green building material of choice. The hexagonal globe frame, including the building's beehive ceiling, is made out of timber. Timber framing was used to create the hexagonal shape of the music center. Clad in glass panels, the interior is flooded with natural light. The curvaceous form continues throughout the interior. The building has a massive concert space as well as an auditorium and rehearsal areas. The star feature of the design is undoubtedly the massive triangular sail covered in solar panels. 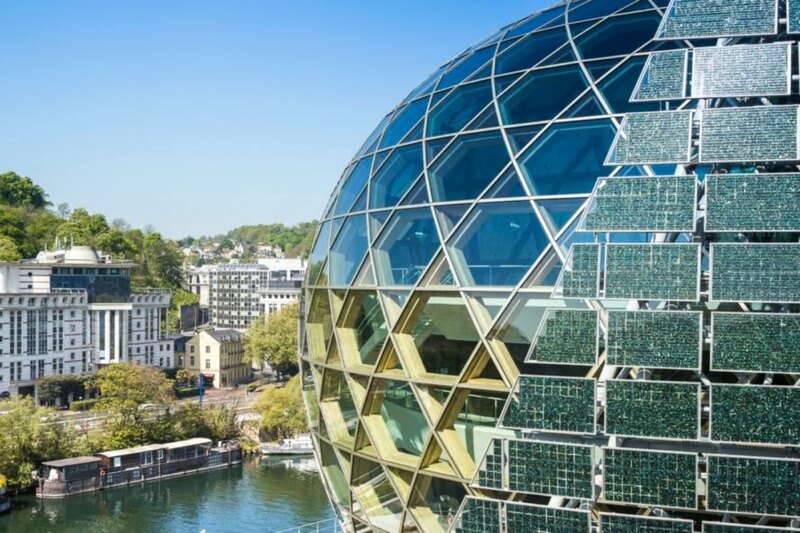 The sail will constantly rotate, following the path of the sun in order to provide the building with optimal solar energy throughout the day. The inside is expansive and has a large grand atrium. Shigeru Ban and Jean de Gastines in front of the Seine Musicale. 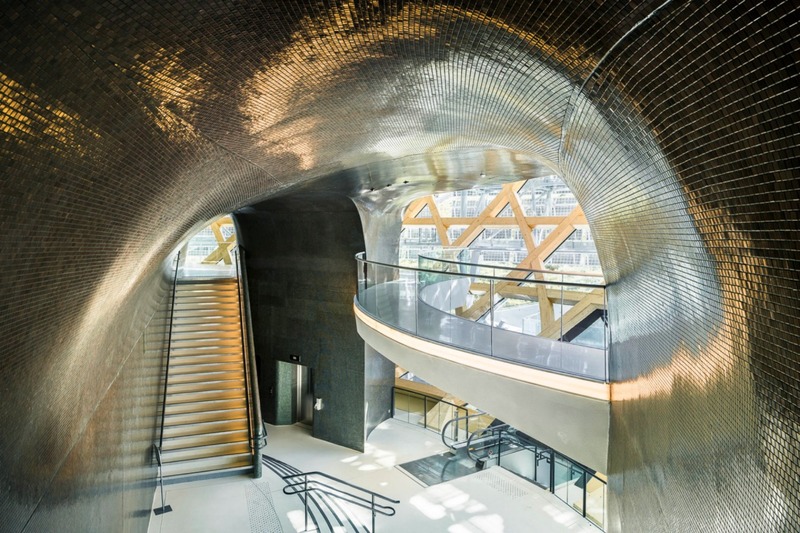 The large covering also acts as a solar shield for the building's all-glass Grand Foyer. ."
The building's design was carefully crafted to fit into Nouvel's urban plan for the area. The building will hopefully become an eco-friendly icon for the developing area. The massive building can be seen from across the banks of the River Seine. Solar panels cover the building's massive sail. 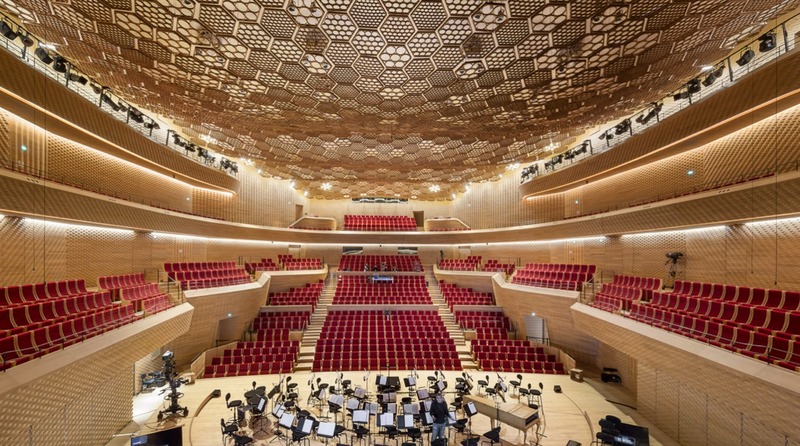 The interior of the Siene Musicale is flooded with natural light.